Kenji sniffs out stupid claims by the Union of Concerned Scientists | Watts Up With That? For those of you who don’t know yet, Kenji is our family dog. 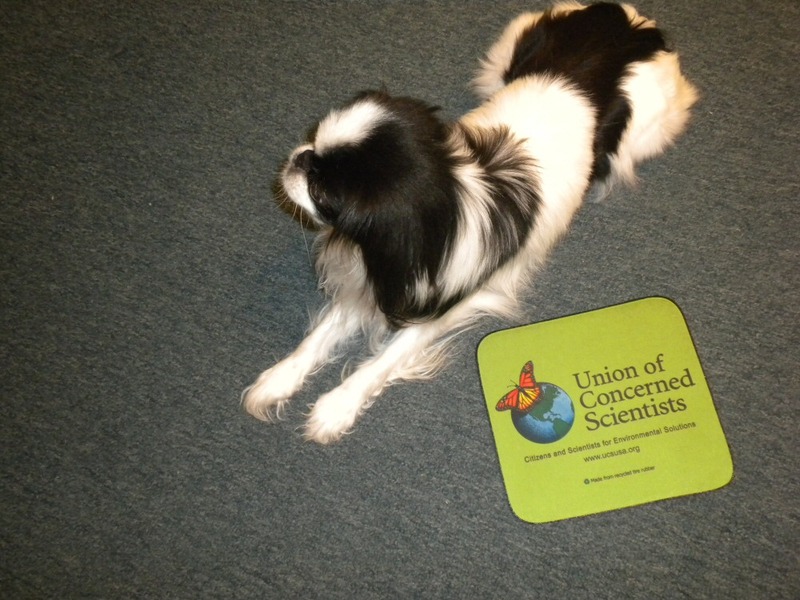 Kenji is also a official dues paying member of the Union of Concerned scientists. see: Friday Funny – The newest member of the Union of Concerned Scientists because as Kenji’s membership proved, you don’t need to be a scientist to join, all you need is a valid credit card. 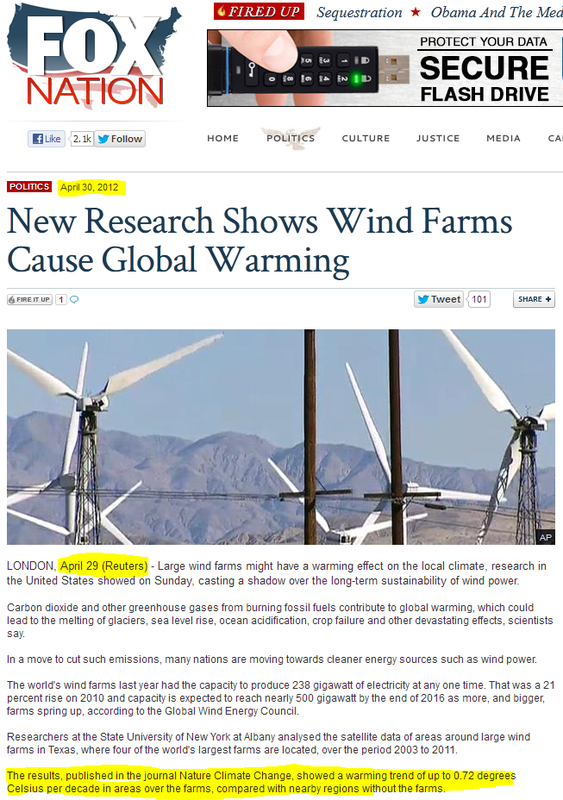 Fox news didn’t make the claim of warming, Reuters did by reporting the story on the science from a press release. Fox News simply carried the Reuters story verbatim as many other news outlets did. But of course, the paid political activists at UCS aren’t upset about that headline, because even though she reported the story accurately, Louise is part of the team on the UCS side of the argument. The National Science Foundation was the source of the story in their press release here. UCS wouldn’t dare be upset about that one. 2. Note also that the study results are peer reviewed in Nature Climate Change authored by SUNY in Albany by examining satellite data comparing wind farms and other areas. The wind industry in the United States has experienced a remarkably rapid expansion of capacity in recent years and this fast growth is expected to continue in the future. While converting wind’s kinetic energy into electricity, wind turbines modify surface–atmosphere exchanges and the transfer of energy, momentum, mass and moisture within the atmosphere. These changes, if spatially large enough, may have noticeable impacts on local to regional weather and climate. Here we present observational evidence for such impacts based on analyses of satellite data for the period of 2003–2011 over a region in west-central Texas, where four of the world’s largest wind farms are located. Our results show a significant warming trend of up to 0.72 °C per decade, particularly at night-time, over wind farms relative to nearby non-wind-farm regions. We attribute this warming primarily to wind farms as its spatial pattern and magnitude couples very well with the geographic distribution of wind turbines. The study methodology isn’t controversial, and the results make sense given that wind farms create turbulence, which mixes the atmosphere more effectively, especially at night. The raises the overnight observed Tmin, which in turn raises the Tavg temperature, creating a local warming trend. Of course, if it was the other way around, and something that produced energy caused some local warming that wasn’t part of the anointed “clean energy” solution set held dear by UCS, they’d be all over it saying it contributed to global warming. We see examples of this sort of bias almost daily in MSM stories about “climate change” and global warming. 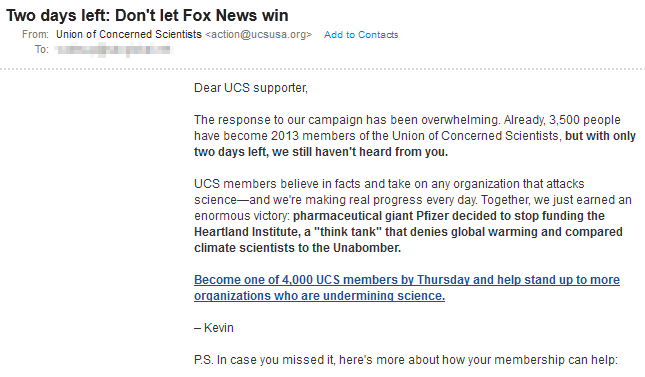 When UCS says this about Fox News: But their twisting of facts is anything but a joke. It is clear that UCS is the ones twisting the facts, and the joke is on them. Even my dog can see through the charlatans at UCS; they aren’t in it for the science, they are in it for the money when they use slimeball tactics like this for fundraising drives. And ask for even more money to counter these “twisted facts”. Let the bloviating for dollars commence! I just can’t get around the junior high school wording of the UCS blurb. It reads like a bad Harlequin Romance…or is it just being condescending? Either way, it is glurge of the finest vintage. Is there any truth in the ‘Pzifer defunds Heartland’ claim? Don’t recall that. Am I supposed to click on something? And here it is, out in the open, as it should be. Thank you for posting this – I wonder how many members UCS has left? As a rule of thumb, if you want to stir up leftists, especially the most ignorant of them, just mention FoxNews. Similarly, if you want to determine who is a leftist, just discuss something you saw on FoxNews. They will always reveal themselves, immediately, usually loudly. Well I think Kevin’s Surname says it all. To be fair to Mr. Knobloch (no inappropriate jokes about his name, now) it seems reasonable that the UCS assumed that as Kenji apparently has a credit card, his canine nature is probably just a ruse. So, there are apparently 3500 “2013” members already, but they then say you would be joining 4000 members. Does this in fact mean that they are losing 500 members this year? In New Zealand in some of the growing areas I am familiar with farmers hire helicopters to stir up the air over orchards/vinyards to prevent frost damage. It’s actually something quite bizzar to watch. Interesting weasel wording in the first UCS letter to the effect that 3.500 credit card holders have become 2013 members, with only 2 days left to renew membership. No mention of a number for new members in that figure. In the second UCS letter there is a claim of a 4,000 membership. I make that a drop of 500 credit card subscriptions over the year. Is this yet another instance of hiding the decline? 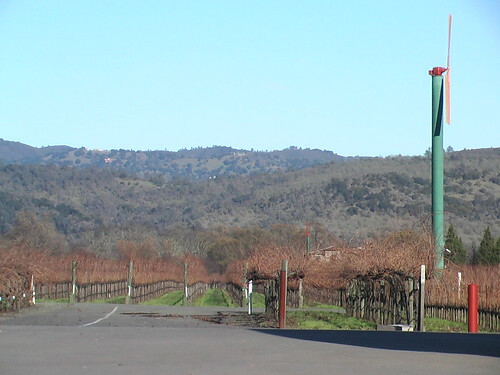 Have not wine growers at at various times used helicopters to stir the air above vineyards to prevent frost damage? Maybe there is a place for wind farms in agriculture . .
“Sharon Castillo, spokeswoman for Pfizer, told The Christian Post that the decision was implemented earlier this month for multiple reasons. “Heartland’s CEO was notified of our decision on December 5th. The decision was made as part of our year-end review. The main reason was budgetary constraints,” said Castillo. Conversely, it could be said that anyone who genuinely believes Fox news to have balanced and un-biased reporting must have pretty hard right wing views. Kenji has a valid credit card? “Your support allows us to be an independent voice for policy change and produce the scientific analysis that make our arguments convincing”. Wot? Which comes first, the arguments or the analysis? As a student studying economics my wife could pick up which side of the political fence her teachers sat (and finding quickly that economics was just saying the same thing over and over in different ways) she would put a question from the opposite view and hay presto they were off on their little band wagon and the lesson would soon be over and she and her classmates hadn’t had to do anything. Is Kenji going to renew his membership or is he going to let his concern wane? People need to know so they can follow his trend setting ways! A similar result may be had in the UK by mentioning the Daily Mail. Interestingly, just saying that something is in the Daily Mail is often sufficient evidence for them that it is untrue – no further argument required. Similarly, UCS seem to be celebrating their ‘achievement’ in ‘defunding’ of the Heartland Institute; presumably it is sufficient for them that dissent is not heard rather than argued against. I’m always left astounded by the utter hatred of fox news. I do not find them conservative in any way. They have a few supposedly conservative pundits, but I guess if every pundit isn’t all far left all the time, then it is extreme right. I suppose also if they bring up stories about Obama that the rest of the news networks don’t report (that they would have reported 24/7 for weeks for something infinitely less serious if the president had an R by his name), then it makes it extreme far right as well. I stopped watching TV news long ago, got tired of the multi-month long 24/7 Natalie Holloway type stories. My time is better spent reading news from around the world on the internet. I suppose I am getting to an age where I should put to some use the little wisdom that I may have gained and perhaps before it drifts into dementia. I have now lived approximately 2 decades in North American, another 2 in Europe and now another 2 in Australia. Albeit all basically Western cultures, I have had the pleasure of living in democracies with all their idiosyncrasies. To paraphrase a Joni Mitchell song ‘I have looked at love from both sides now’ – and not to get get off the topic since I have looked it from 3 sides now – it has been enlightening and at times annoying, but nevertheless part of the human condition. Although democratic societies may be the worst form of government – except for all the others (OK, Churchill – but he himself probably lifted it from someone else) – they are fairly robust to allow the expression of a diversity of opinions and that is their glory. I hope we have moved on from the various Inquisitions where non-complaince by the Roman Catholic thought police brought a terrible penalty. There should be groups that promote a range of views – from Fox News (which I personally take a dim view) to far leftist views (ditto). Let the debate continue but no one side should try to shut the other down. If the Concerned Scientists are so concerned then they should turn whatever talents they may have to using their intelligence to offer solutions if they are convinced there is a problem and not pursuing careers that may do little more then bring home the bacon for themselves. And, by-the-way, I recently received a certificate congratulating me as being a member of the American armed forces – which I am not, although family members have served in the armed services, but I would belittle the organisation to try to accept me, let alone my dog. I have very much liked this blog over the years but it does seem to be trending to belittlement rather than genuine debate. Please try to keep the level of standards that you have maintained from the most part and not get into the same gutter as some others. If I was called Knoblock I would change my name. Sounds like a Monty Python character or very rude. Yes att the research from Germany, Denmark etc show that wind power leads to an increase in CO2 production because of the running backup. Why not just run the backup forget the wind turbines. Much cheaper and lower power costs to the overcharged customer. Perhaps an updated more-accurate organization name would help them, along with retaining the acronym for some familiarity. The Union of Concerned Scientists seem very proud in their abilities to destroy the democratic process. If it is true that they have put pressure on Pfizer to withdraw funding for Heartland, they are demonstrating that no opposition to their distorted and repressive view of modern society is acceptable. Exterminate! Exterminate! seems to be the cry. Sometimes “Low information voters” are quite well educated. The Union of Concerned Scientists is exploiting people who have no information by feeding them a small amount of true, but heavily one sided, information. This elevates them from ‘no information’ to “Low information voters”. Because I’m a skeptic’s skeptic, I honestly don’t have a problem with the Union of Concerned Scientists. I don’t have a problem with T Boone Pickens. I don’t have a problem with tele-evangelists. I don’t have a problem with anyone who spots a gap in the market that they can exploit to make money. Okay so it’s not making an honest living but close enough. Pfizer is presently divesting itself of it’s Agricultural Division which has flat lined in profitability. There are a lot of promos to boost sales before the IPO.This would burn cash. The human pharma is going well.If true they don’t seem to need Heartland for anything anyway. So defunding Heartland is possible. Kevin Knobloch, Knob-lock? it has to be a joke! I just skimmed over the UCS claims and had a terrible laughing with each paragraph. Can such a bag of quixotics really be a serious organization? Anthony, you should be glad that Kenji cannot read, otherwise your bills for an urgently needed animal psychologist would be huge! 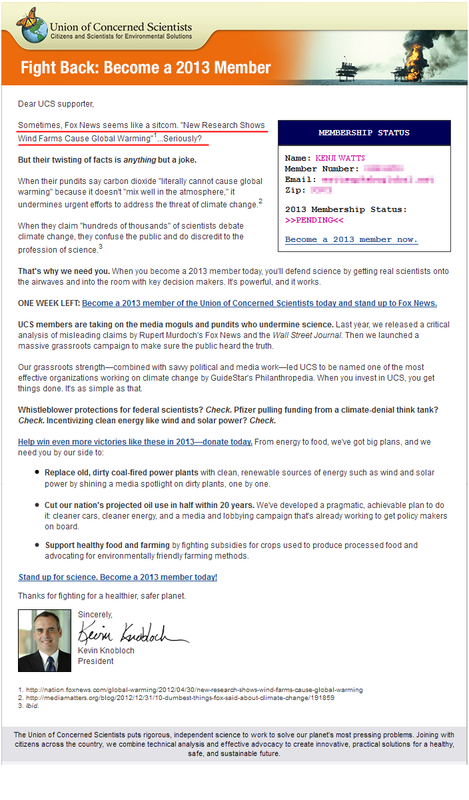 I got on the email lists of a couple of environmental savior groups. From the tone of the emails, all wanting my contribution, these are mean, nasty people. So does Kenji plan to renew for the sport of it? Or has he had enough already? Have you seen the interview of Jon Stewart by Chris Wallace of Fox a few months ago? Chris admits Fox presents their side of the news, supposedly to counteract the MSNBC side of the news. The documentary Outfoxed a few years ago showed the connection between Fox and the Republican party. I suspect most people who are not die hard Republican might have a problem with the Fox slant, whether they are ‘ignorant’ or not. Fox is certainly slanted. CNN and MSNBC are certainly guilty of sensationalizing news – to keep viewers willing to turn into that stuff. UCS is certainly slanting their material in an attempt to get more money. Have you ever received junk mail from a charity asking for a contribution (to alleviate a disaster described with the plea)? Global warming is not a left wing socialist plot. Read the recent book by Henry Bauer, Dogmatism in Scienced and Medicine, to see how often the flow of money affects science and medicine. That corruption is often described here in WUWT. It does not also imply this wild tangential connection to everyone who is left wing. ..but with only two days left, we still haven’t heard from you. Will I miss out on the latest and greatest ab worker to gather dust under the bed or the free set of steak knives? Tell me I’m not going to miss out on the two for one deal if I’m not amongst the next 500 lucky callers. Doesn’t Fox have what’s necessary to take on these dumb-nuts? Perhaps they prefer to let WUWT fight there battles for them. There is some interesting breaking news morning, off topic but I hope Kenji won’t mind. Lord Lawson has written to Sir Paul Nurse, president of the Royal Society, describing comments that Nurse recently made as a ‘lie’. So far as the latter is concerned, you claim that I “would choose two points and say ‘look, no warming’s taking place’, knowing that all the other points that you chose in the 20 years around it would not support his case”. That is a lie. I can understand why Kevin knobloch wants to protect the environment from adverse degradation, which of course we all do. But why does he and his cohorts not have an open mind to climate science which he quite obviously hasn’t. Why does he and his ilk talk about sceptics as ‘attacking science’ ? How can you attack science per se? You can attack – I would prefer to call it question – scientific theories, or offer scientific alternatives to scientific research results, or bogus scientific data. That is the way science has been conducted since time began. Yet people like Knobloch treat those who might put forward sound scientific arguments against the consensus, many presented by scientists who are far more qualified to do so than Knobloch, as complete idiots or deniers who are attacking science. How stupid can you get? Furthermore, why do these people deny the science that tells us that there has been no warming for 16 years, that the seas are not rising as they forecast, that the snow which they told us would never be experienced by our children, is heavier this year than for many years. That the polar bears are not dying out, or that snow on Kilimanjaro is returning, that coral reefs are not threatened as they like to believe, or that a miniscule increase of carbon dioxide in the atmosphere has not been followed by the global warming that they forecast? And why do they not accept that hurricanes and fires across the world are not more prevalent this year than the average over many years, but lie and try to convince us otherwise? You have to wonder if Bill Maher is the clown running the UCS. At least they are demonstrating that it does not take intelligence to put out mailers. But then SPAMMERS told us that, so I guess they really do serve no purpose. President Knobloch’s surname is a corruption of “knoblauch,” which means “garlic” in German. Garlic was used by superstitious societies to ward off vampires. How apropos for the president of UCS. I must admit that Kenji stayed as a member for that long is shocking. I had expected someone lurking over your website, would inform UCS about it. Pretty funny. reporting that the sun rises in the east, but until he saw it on CBS-he wouldn’t believe it…. So wind farms increase localised night-time temperatures, presumably therefore increasing the average (low-+high)/2 and therefore “increasing global warming”. Doesn’t that just demonstrate the simplistic approach to AGW that we’re faced with? I think that it’s generally the case that “global warming” is in fact primarily a result of increased night-time (low) temperatures in any case, and that max temperatures have hardly changed? I’m sure nobody in AGW-land cares about this not being widely understood, but the general public perception is that warming means higher max temperatures. Imagine if the world suddenly came to see that AGW is simply keeping us warmer at night. It would be something to celebrate! So is Kenji going to renew his membership? If he was not a member, would you have known about this? Mr Knobloch earns the princely sum of $239,866 for running this outfit according to Charity Navigator. I decided to hunt down the source of the mixing quote. Google came up with an (inflated) estimate of 5,450 matches on my search for |”literally cannot cause” carbon dioxide “mix well in the atmosphere”|. Many of these referred to “10 Dumbest Things Fox Said About Climate Change In 2012” by mediamatters.org. In trying to pick out one of the earlier references, one filed under Joe Bastardi caught my eye. That went to a list of stories involving Joe, and one simply went to the list of “10 Dumbest…”. Okay, okay, I’ll check it out. It looks like that’s the source of the text in the UCS letter. “Carbon Dioxide ‘Literally Cannot Cause Global Warming'” is #3, “Wind Farms Cause Global Warming” is #5. Each has links to the Fox story. BASTARDI: CO2 cannot cause global warming. I’ll tell you why. It doesn’t mix well with the atmosphere, for one. For two, its specific gravity is 1 1/2 times that of the rest of the atmosphere. It heats and cools much quicker. Its radiative processes are much different. So it cannot — it literally cannot cause global warming. Bastardi doesn’t understand the first thing about the greenhouse effect – it has absolutely nothing to do with the ‘specific gravity’ of CO2 or any other greenhouse gas, it has to do with the fact that GHGs absorb and radiate infra-red heat and in doing so warm the surface of the Earth. There’s a few things I could pick apart with Gavin’s quote, but all in all, what the heck is Bastardi trying to claim? There’s plenty of convection to keep CO2 (molecular weight 44), and argon (40) mixed in with nitrogen (14) and oxygen (16). Argon is 1% of the atmosphere, if it didn’t mix well, the world would be a very dead place. Perhaps there is a bit of a difference with height, especially in the stratosphere, but I think checking into tropospheric mixing and settling would be a waste of time. Googling |bastardi carbon dioxide “mix well in the atmosphere” -mediamatters -matters| yielded one hit – and that referred to the Fox story. I’d like to see Joe explain just what he meant, but for now, WUWT has derided people for much less. Joe, I think you blew that one big time, you better climb above the argon layer! “As a rule of thumb, if you want to stir up leftists, especially the most ignorant of them, just mention FoxNews. Hey CT, the same thing could be said about WUWT when one is talking to a leftist AGW zealot. They’re on the same level as the Nigerian Million Dollar scammers, and looking to hit the same gullible marks. When your entire culture depends on fraud, there’s no restriction on what you can say – in fact, the wilder the lies, the better! We are no longer dealing with people who are simply wrong – we are dealing with what has become an embedded culture of corruption and dishonesty, dedicated to nothing more than separating the simple minded from their money by any means possible. Could it be because Fox News is not a leftist organ and tries instead to be more even handed in reporting and talking about the issues than other news organizations? ….advocating for environmentally friendly farming methods. The foul waters of the tailings pond contain all sorts of toxic chemicals, but also radioactive elements such as thorium which, if ingested, cause cancers of the pancreas and lungs, and leukaemia. Other reports on the toxic waste in Mongolia can be found here, here. Will the UCS now lobby governments to ban the importation of wind turbines into the US that use rare-Earth metals from the region? Will they also lobby to ban the importation of rare-Earth metals from this region? They need to show that they stand for their middle name “CONCERNED”. Or are they only “CONCERNED” about Westerners? Thank you for your interest and let me know if you have further questions. Join the conversation on our blog or follow us on Facebook and Twitter. It would be astonishing that Louise Gray is so off-message if there was any evidence that she understands anything she “writes”. Her day seems to consist of cutting and pasting Greenpeace, WWF and FOE press releases. This probably just got into the wrong pile. She’ll be posting her shopping list next. CodeTech — as a rule of thumb, leftists know NOTHING of things outside of their leftist bubble. They go off half-cocked on the latest Facebook zinger, and then smugly assume they’re one of the smart, cool people. Saw it on Drudge Report. That was the end of our ‘union’. I treat Fox like any news outlet, with skepticism. I agree with all my left leaning friends that FOX News is decidedly biased to the ‘right’ side of things…and they all smile. Then I add “…much the same way that all the other major news organizations, including CNN, NPR, BBC, NYT, NBC, ABC and CBS, are decidedly biased to the ‘left’. Somehow, we are still friends. I used to deal with Kevin Knobloch when he was a Senate staffer for Tim Wirth. He helped Wirth orchestrate the original Senate hearing on global warming. If you buy global warming, greenpeace and/or UN world Order&peace, you are on the suckers list. Well to do, easily duped, whats not to like from a flim flam artists point of view? Over at American Thinker February 24th an article by Paul Masko, has some in sights as to why logic, reasoned argument and empirical data make zero impression on the certainty of the faithful. “3 Reasons Conservatives are Losing the Battle For America”, I would offer a link to this but am technologically inept. One can substitute Canada, Australia or Britain and the logic still holds. The aspect of group think(refusal to think), wilful ignorance of history and ability to ignore the evidence of their own eyes, described , is well worth a post of its own. I hope it reads as more than a wail of despair. The inability to communicate and have rational arguments, the stolid refusal to debate and refusal to examine the evidence available, that are characteristics of this CAGW cause have concerned and annoyed me from the first time I questioned a believer. Public policy is and has been passed into law, using circular logic devoid of science. The otherwise intelligent people who have pushed these policies are impervious to logic and answer all requests for data with well polished deflection?? Read the 3 points I feel he highlights some things I have not seen clearly before, and some different tactics will be necessary to reach the friends and family caught up in this cause. Warming Texas up!! We may get that all time record drought. It must push the dew point farther away from subliming, too. Thanks for link up, I felt a little deflated, defeated on first read, but I think its truth and if we cannot stomach the truth we may as well join the destroyers. And after thinking on it, I think it opens up some interesting approaches to engaging the “lost”,to return to being productive members of society. My thoughts are not quite coherent yet , as to which ways work best but definitely feel we need to acknowledge the state of mind the faithful are maintaining. Our results show a significant warming trend of up to 0.72 °C per decade, particularly at night-time, over wind farms relative to nearby non-wind-farm regions. I see no justification to make this a “trend” in units per decade. There is likely a step change from pre-windfarm to post-windfarm. We might be able to estimate a RWFHI (Rural Wind Farm Heat Island) warming effect in units of °C per GW (Nameplate) in a 50 km radius. I suspect that will be a scary number on its face and could be useful to have in our back pocket. I sometimes think Kenji runs your whole web-site (compliment to the dog). So how does this affect the supposed altitude correction at all those thermometer sites?? Too bad those altitude versus temperature charts don’t have error bars! Kenji is cute in an ugly way. Kenji ought to put a firm paw down here. He ought to have a bone to pick with these people. These people are nothing short of dangerous misanthropists, wanting to stop fossil fuels and force nations onto expensive, unreliable renewable energy. They boast of “achievements” that are in reality deeply disturbing – propagandists and extremists masquerading as scientists. I hope Kenji tears up his membership card and sends it to Knoblock personally in a package that contains a little message – the sort that a dog does best. I don’t belong, but I think I’ll register my dog, Sylvie. If we get enough “real” dogs enrolled, perhaps they can make a difference! UCS: Union of CONFUSED Scientists. CO2 cannot cause global warming. I’ll tell you why. It doesn’t mix well with the atmosphere, for one. For two, its specific gravity is 1 1/2 times that of the rest of the atmosphere. It heats and cools much quicker. Its radiative processes are much different. So it cannot — it literally cannot cause global warming. Anthony sent my comment to Joe, Joe replied back, Anthony forwarded it to me. Joe addressed both phrases, though I was mainly interested in the “mix well” phrase. We have plenty of discussion about the “cannot[/does not] cause” but the mix well phrase is a bit of a trigger for me. It appears the main problem is we don’t have a good definition of “mix well.” I’ll have trouble coming up with one that isn’t self serving, so I’ll be vague and note that discovered it’s not so easy to check a thermometer with a glass of well mixed ice water. Even if I have a lot of ice and stir the glass well, I was surprise my thermometers alway read a little above freezing. Even when I had the bulb in the ice I’d get a reading a bit above freezing. Eventually I decided there was enough warmth coming in from the sides and convection so that the liquid would be a bit warm. I concluded the water bath technique works better in the freezer or outside on an overcast subfreezing day. Any cold working its way in will make more ice before reaching the thermometer. I considered the water in my glass well mixed. I consider CO2 in the atmosphere well mixed even though there are sources and sinks that are changing the local ground level amounts. I don’t really count that as “demixing” – you get that from processes chem lab precipitates or corn starch settling out from a cup of chow sauce. The source for the photo (with better resolution) is http://photojournal.jpl.nasa.gov/catalog/PIA09269 and one with a better scale is http://photojournal.jpl.nasa.gov/catalog/PIA10645 . 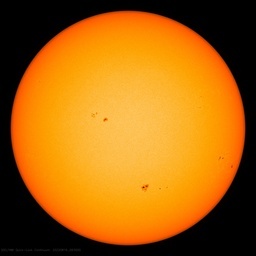 A 2009 variant is at http://photojournal.jpl.nasa.gov/catalog/PIA12339 . The images are from an IR sounder on the Aqua satellite and measure mid-tropospheric heights, I think some 20,000 to 30,000 feet above sea level. Mauna Loa in July 2009 measured some 387 ppm, in the same range as the satellite. The MLO observatory is at 11,000 feet. So it looks as though vertical mixing is minor. Some satellite soundings are described at http://www.atmos-chem-phys.net/11/2455/2011/acp-11-2455-2011.pdf and go up to 70 hpa in the stratosphere. The CO2 variance is only some +/-4 ppm along the sounding, so no real sign of settling in that range either. Ironically enough, the source of the mixing of CO2 from sizable variances at the surface upward is largely convection. Diffusion and orographic effects must be much smaller. I think convection has a major role in transporting heat high enough in the atmosphere where CO2 can radiate it to space efficiently. We don’t have good information about how much air cycles through convection, but a small increase would be enough to offset a small amount of global warming, and would greatly reduce the CO2’s climate sensitivity. So, I claim a well mixed atmosphere is a major reason why global warming is not the problem the alarmists make it out to be. Whoa! I must live in some ALTERNATE unviverse. Back in the ’80’s the UCS at their HEIGHT of using their inordinate propaganda power, the lilly livered cowardice of Utility executives, and the arravice of J.E. Carter to destroy nuclear power…they claimed 40,000 members. Politely declining ANY request to validate their members credentials, or back the validity of that number. NOW they are claiming 4,000 members? IF THESE NUMBERS ARE TRUE, they are in a “losing position”. THIS might be the best “lefty loonie” news I’ve heard in years! Exercises in Translation visa vie Transliteration with feedback and the Convolution Theorem. Fox news is slanted.. republican religious, (notice I didn’t call them conservative) but if you think there is a news channel out there that isnt maybe you are missing the fact that all of them are owned by giant parent corps (including newspapers, and mags) that most likely have their own agenda’s. Furthermore I have yet to see Fox news play a story that the AP didn’t release first.. check any channel, any day and you will find the same 4 or 5 stories on all of them… given the station slant of course. The interesting thing about that is, the AP shortens local stories from news orgs and gives them their own slant, often by leaving out specific facts. The news is propaganda, just pick your flavor. .. but good news, it takes very little effort to go look up the original story. on the union… 3500 suckers born every minute?? heheh. …they claimed 40,000 members. Politely declining ANY request to validate their members credentials, or back the validity of that number…. NOW they are claiming 4,000 members? If these numbers are true [no need to shout! ], they are in a “losing position”. I assume their monthly magazine (at least they had a monthly magazine when I was a member in the 1970s) is mailed at periodical rates (used to be 2nd class until some PC weenie fixed that). At the end of every October, periodical permit holders have to report their Ownership and Circulation data to the USPS and print it in the next issue. The report form doesn’t have to be used, I created a very compact layout we print in the newsletter I mail. Anyone with time and access to back issues can go searching for it and tally up the results. One caveat – the form has people report the average for all issues and the actual data for the most recent issue. There are several reasons, but comparing the two looking for a trend does not work well. This is very clever pretending to be a dog to get information from the Union of Concerned science. What else did you find out? Do they send out instructions to members of how they fake global warming or have you not got high enough in their organisation yet? You could try for the committee except I guess they might figure out who you really are and kick you out. Good on you for showing iniative. 1. The UCS clearly states that it is an organization of “citizens and scientists.” No need for feigned shock that it accepts non-scientists. No need for Kenji to “prove” that it accepts non-scientists. It says that it does on its About page. 2. There’s nothing “completely false” about the UCS claim. 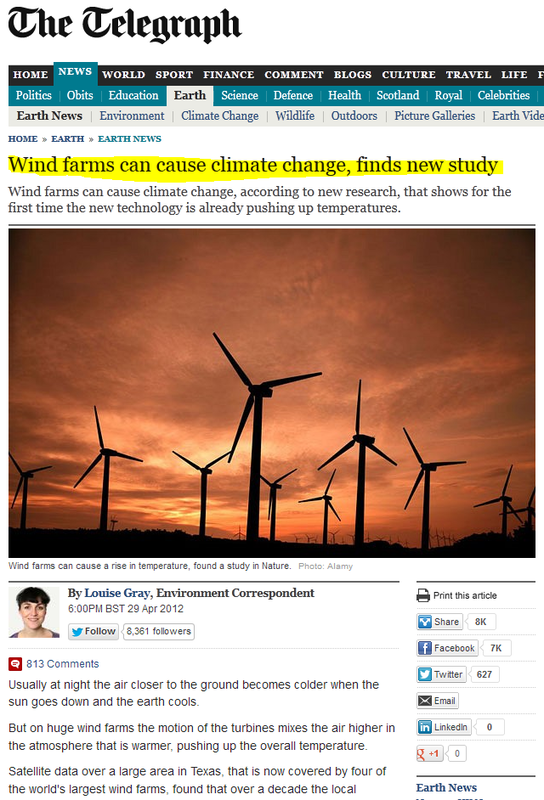 UCS says that Fox reported that wind farms cause global warming. Fox did that. 3. UCS didn’t “twist” any facts. It correctly reported what Fox said. 4. “Reuters got it wrong” is a pretty lame excuse, whether for Fox or anyone else. They’re supposed to be news organizations. They’re not supposed to report false information, regardless of the source. The first sentence of the Reuters piece was sufficient to know that the headline was wrong. Fox apparently didn’t even read it. To forestall the inevitable incorrect inferences, no, I don’t have any connection to the UCS. I’m not even a member. I always get a laugh when I hear people say things like that. It’s been my observation, not yet falsified, that people who say things like that never watch Fox News. The first person I remember saying it was a former co-worker who was proud of the fact that he didn’t have a television. Many of them, when pressed, will admit that they “know” it’s true because they heard it from the lips of Bill Maher, Jon Stewart, Stephen Colbert or Joel McHale (The Soup). Fox News personalities like John Stossel and Jesse Watters, who does regular man-on-the-street interviews that are featured on Bill O’Reilly’s show, challenge every person who repeats the “Fox Lies!” mantra. When asked to give an example to back up their assertion, they slink away. Always. @Lynn Clark – I have an open challenge for anyone to demonstrate right wing NEWS reporting bias (or even lies as is often the accusation) by Fox. So far, the challenge is unmet. Most of the time, it readily becomes apparent the accuser does not know the difference between a news show and a commentary show.